Hello The 36th Avenue readers, it’s Angelina from JoJo & Eloise. 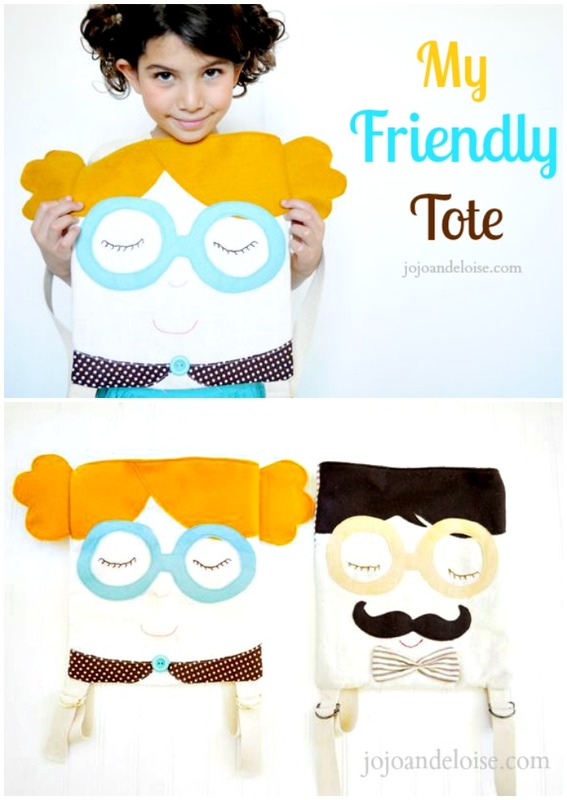 Today I’m sharing a super adorable DIY Tote Tutorial, just in time for back to school . I know… Cute, right? Your going to cut out a basic Rectangle Square shape. ( mine is 13×11.5) 2 of your main fabric and 2 for your lining. I used Linen Fabric for my main bag and cotton for the lining. You really could use any fabric that you have on hand or that you prefer. For the hair and glasses I used Felt, on the collar I used cotton. D rings and cotton belting for the straps. I used some computer paper and laid it across the top of my bag and drew out a shape for hair. I then cut it into 2 pieces so that I could over lap it for the hair. I pinned my 2 pieces to the front of my bag and sewed in place. Then taking some embroidery floss I embroidered the shape of the eyes, following my pencil lines. Repeat the same process for the Nose and Mouth. Then take another piece of paper and set it against the sides of your bag where the hairline is and draw a shape for pigtails. Id your making a boy just leave as is. Cut it out and use as a pattern to cut your felt. Place your pigtails right sides together and pin in place. If you want to make a collar draw a shaped and stitch in place. Or you could make a bow tie for a boy. Cut a small piece of your belting and stitch below the D rings to hold them in place then pin to the bottom of your bag corners. Take the right sides of your main bag fabric and sew along the sides and bottom, leaving the top open. Do the same thing with your lining but leave an opening for turning right sides out later. Cut 2 pieces of belting for the straps of your bag. Cut according to size and length needed for the size you are making. Stitch in place. Place the Right sides of your bags together by placing the MAIN bag inside the Right side of your lining. Now turn your bag right sides out, through the opening in your lining. Stitch your opening closed and your DONE!! Now tell me this isn’t Cute!!! You can make these as BIG or as small as you want. This one below is actually our older sons but this little man likes to carry him around. So I think I need to make a smaller one for him. Angelina is super talented… Let me show you some other of her projects that I love. Please take a minute and visit Angelina’s blog JoJo & Eloise. You are going to love her and her work. Also follow her on Facebook, Twitter, and Pinterest. Oh my cuteness! Angelina rocks!!! Super Cute! 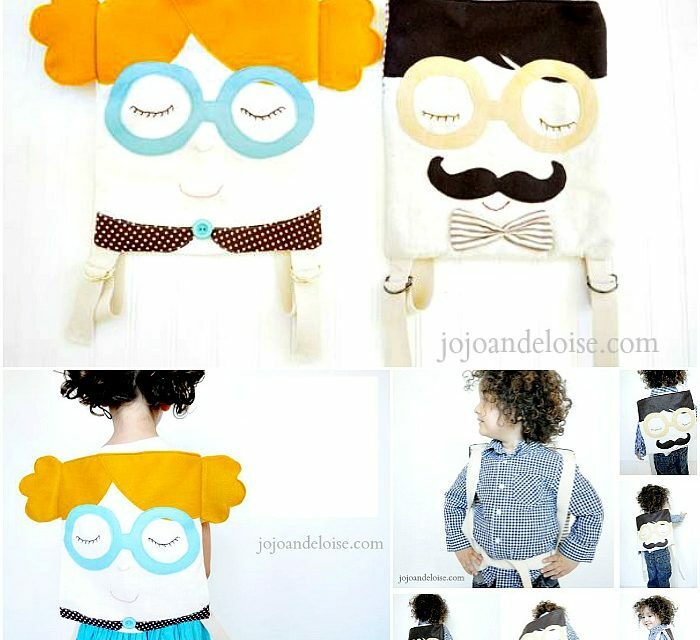 My daughter was just gifted a cute owl pack similar to these. Love, love LOVE. LOVE the tote bags. so fun!